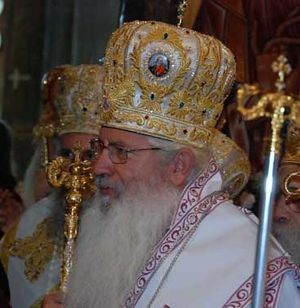 Metropolitan of Thebes and Levadia, Greece. The Greek Orthodox Church is one of two branches of Christianity which originated as a result of the Great Schism. The triggering event for the break was the refusal of the Patriarch of Constantinople, Michael Cerularius, to recognize the Church of Rome as the head of the faith, as well as the refusal of a group of Roman Legates (sent by Pope Leo IX) to bestow the title of Ecumenical Patriarch on Cerularius. Following this, the Cerularius excommunicated the legates, while the head of the legates excommunicated Cerularius. The schism was preceded by very apparent hostilities on both sides. Both the Western and Eastern branches of Christianity had attempted to suppress the language of the other. There had been longstanding doctrinal disputes dividing the branches, reaching back to the early (180 AD) days of the Church. Among other divisions were the mandated celibacy of Roman priests, the Roman Church's use of unleavened bread for sacrament, and the Western Church's insertion of the phrase "and the son" into the section of the Nicene Creed which reads, "And in the Holy Spirit, the Lord, the giver of life, who proceeds from the Father and the Son." This page was last modified on 19 July 2016, at 09:58. This page has been accessed 4,382 times.